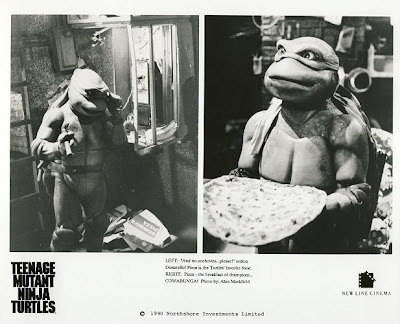 The outrageous, fearsome four green teen turtles Raphael, Leonardo, Michaelangelo and Donatello and their ninja mystical master Splinter were all brought to life by Jim Henson’s Creature Shop in London. Though the full extent of what they are is a carefully-guarded secret, a broad overview of their creation may be told. 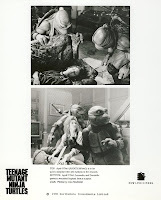 Led by Creature Shop creative supervisor John Stephenson and production supervisor William Plant, work on constructing the turtles and Splinter started in February of 1989. In the past, a close-up of an animatronic’s head, Stephenson explains, has required several puppeteers and much rehearsal to produce the required expressions. 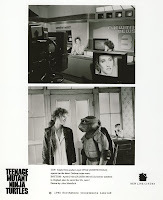 For the “Turtles” movie, a way had to be found to enable close-up turtle heads to lip sync fast and efficiently, combining all the extreme cartoon type facial expressions found in the comics. “Dave’s technology gave us the system we needed enabling accurate, immediate facial movements while moving from one expression to another,” adds Stephenson. 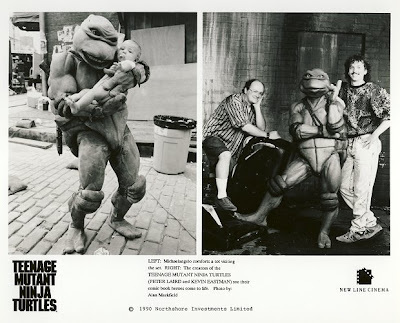 The movie’s chief puppeteer and second unit director is Brian Henson (son of Jim), who had the responsibility of directing many of the stunt scenes and also making sure that all the puppeteers perform their characters to the very best advantage. His puppeteer credits for television include “Fraggle Rock,” “Mother Goose Stories” and “The Storyteller.” Film credits are “The Great Muppet Caper,” “Muppets Take Manhattan,” “Return to Oz,” “Santa Claus, the Movie,” “Labyrinth,” “Little Shop of Horrors” and, most recently, the Warner Bros. Feature “Witches,” scheduled for a 1990 fall release. 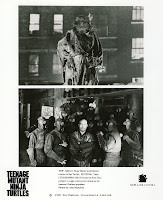 Before filming began, Brian ran rehearsals with the performers and the characters so he would know their performance capabilities and could be of important assistance to director Steven Barron during the actual shoot. 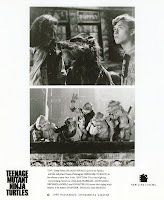 The puppeteer sophistication utilized in making the film is far beyond anything Henson’s Creature Shop has done in the past. The most notable advance is the use of computers to transmit signals plus a multitude of servomotors, which are lighter and more durable than ever before. -->> D ' YAAAAAAAAAAAAAAAAAAAAAAAAAAAAAAAAAAAAAAAAAAAAAAAAAAAAAAAAAAAAAAAAAAAAAAAAAAAAAAAAAAAM !! You are on fire with this, Rose. Wish I felt that way. This is good stuff Rose, thanks for posting it. I've been hunting for this press kit for a long time. 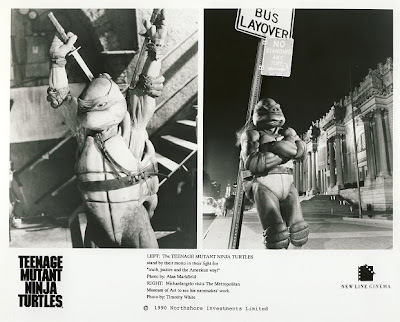 My favorite of that lot was always Raph leaning on the Bus Layover sign, "No standing"...I want that in full color and framed. I can dream. -->> ..your friends still lcare about you , Rosie. Thanks a buch for posting this press kit, Rose! 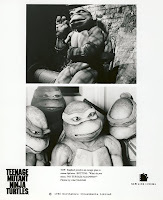 It's always a treat seeing new stuff about the original TMNT film! I totally agree that they should do a proper treatment of the DVD! It was an awesome movie for it's time, and very well done! -->> obviously, Mr.D. .. your source of information is limited for some reason.